Sometime Gardeners just have to garden. 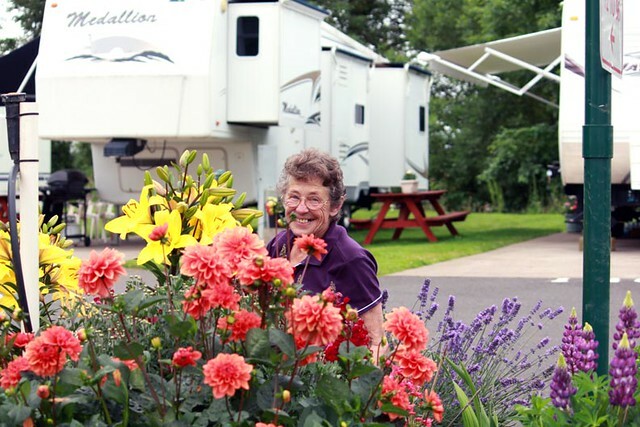 Even in RV parks, so this beautiful woman made this corner of the park just as beautiful as it could be. I think what your seeing is one of the blooms on that plant. I didn’t quite get the picture right. Nonetheless, it’s a beautiful flower bed and and beautiful gardener. My, my, my. How about taking it down a notch or two, Jean? There was nothing negative in my comment. And even if there were…only administration-appointed Blog Police are allowed to spank offenders.